Many new homes and commercial buildings need to meet ADA standards and accommodate people with mobility challenges as well as those who plan to live independently well into their senior years. Barrier-free Design, also called Universal Design and “inclusive design,” provides a comfortable environment for everyone while including additional accommodations for wheelchairs and other mobility aids. Wider doorways and transition spaces, as well as handrails and grab bars in select places, allow not only more ease of movement but more protection against falls and other hazardous accidents. We’re all used to seeing barrier-free spaces in hospitals, clinics and other healthcare facilities. 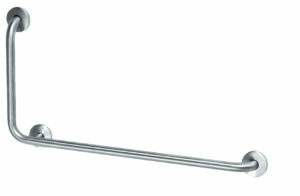 Grab bars located in bathrooms and other places as well as handrails designed for safety and to support movement are often thought of in a clinical or even “institutional” sense. Many of us picture a sterile looking brushed stainless-steel tube mounted to the wall at an easily reachable height. However, there is never a need for that clinical look! The metals used in building Barrier-free features into homes can be formed into a desired ergonomic shape as well as any color and texture you want. They can be as far away from sterile or clinical-looking as an architectural railing with an antique bronze patina or a glossy burnt orange finish! 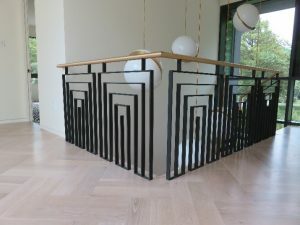 Various grades of s teel and other metals such as bronze can be fabricated and finished to meet your vision of a beautifully elegant barrier-free design. Combining wood, stone, synthetics and other materials into the joinery and mounts can add warmth and style to the rail or bar structures and supports. Certified Aging in Place Specialists (CAPS) have the advantage of understanding ADA/code requirements as well as design techniques and construction methods for Barrier-free spaces in which everyone can feel “at home.” These architects and design-build professionals help those of us with mobility challenges live better lives. We’re always pleased to hear from architects with unique challenges involving metals. Barrier-free designs often present these challenges. If you have a Barrier-free design project that requires specialized metal fabrication, we can help you provide a beautifully elegant solution. Feel free to contact us to speak with an architectural metals specialist. © 2019 Modern Metal Solutions. All Rights Reserved.